Havana's isolation has made it a unique city, but how long will that last? (CNN) -- The seductive port of Havana is an unlikely accident of geography and history, a rum-tinged cocktail of Caribbean exotica, colonial Spanish elegance and Cold War-era politics. 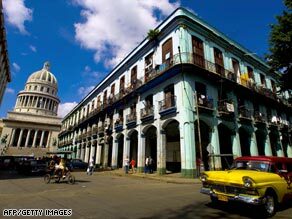 Havana -- a heady cocktail of Caribbean exotica and colonial Spanish elegance. Through its years of post-revolution isolation it has evolved differently from the rest of the world, so that Havana feels like it belongs to some parallel universe. In a homogenized world of 'McCities' subject to the same trans-national fads and fashions, Havana is defiantly unglobalized and proud to play by its own rules. Parts of the Cuban capital are breathtakingly beautiful. Extensive restoration work means the fading grandeur of Old Havana has been saved from vanishing entirely and the bustling streets still conjure up the city's colonial past. But beyond the made-over historic plazas, there is a desperate need for modernization. The phrase "modern Havana" is an oxymoron, aspects of the city seemingly cryogenically frozen in 1959, the year of the revolution. For visitors, that means a voyeuristic glimpse into a time capsule world, but for many Habaneros the city is not just stuck in the past, but stuck in a rut. The same old Buicks and Chevys from the 1950s belch fumes under billboards bearing revolutionary slogans from the same era. Watch Carlos Acosta take CNN on a tour of Havana. ». Politics seeps into every aspect of life in Havana. Fidel Castro may have handed power to his brother but his shadow looms large over the city. There has been much talk of reform since Fidel's resignation, but change has been slow to come. The frustrations of many Habaneros are symbolized by the country's dual currency system. Tourists get to spend convertible pesos in the city's best stores, while locals are paid in regular pesos, which they can only spend in shops that often lack even the basic goods to which their ration cards entitle them. But although most Habaneros seem resigned to living in a system they are powerless to change, their fatalism is tempered by an irrepressible vitality. Any street party provides plenty of evidence of that, as do the sounds of son, salsa and reggaeton that fill the Havana night. Wander through central Havana to the Malecon, the sea-front promenade teeming with hustlers and crowds of Habaneros, and you'll see beyond the time-warp cliches into the real Havana. Look out at the ocean at sunset and you might get the feeling that Havana is somehow cut off from the rest of the world, and is all the better for it.